Wednesday and Saturday, 10 AM to 12 Noon, Memorial Day through Labor Day. During the off season, the Museum Resource Center is heated and open every Wednesday from 10 AM to 12 noon. Admission is free. Donations are welcome at the door. Wifi is available. 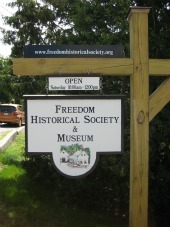 Located at 28 Old Portland Rd in Freedom Village, the Historical Society is 8 miles east of Center Ossipee, 15 miles south of Conway down Route 153, and easily reached from Route 25.